Dermalogica has recently launched two multifunctional and dermatologist tested formulas to provide lasting coverage for a smooth, even finish while simultaneously deliver superlative skin treatment and protection benefits. Dermalogica introduces the new Dermalogica Sheer Tint SPF20 (A$77/40ml) and Dermalogica Cover Tint SPF 20 (A$74/40ml). Dermalogica Sheer Tint SPF20 provides the lightest coverage between the two new formulas and was actually re-formulated based on Sheet Tint Moisture SPF15 to provide higher broad spectrum defence against UVA and UVB damage and skin treatment benefits for the skin. These skin benefits include even skin tone, soften fine lines and effective moisturisation via the key ingredient Hyaluronic Acid, by the means of allowing the skin to hydrate adequately during the course of the day. The formula also includes Hydrolysed Pearl amino acids and antioxidant Walnut Seed to help improve skin texture and reduce the appearance of fine lines. Dermalogica products are free from artificial fragrances and colours. 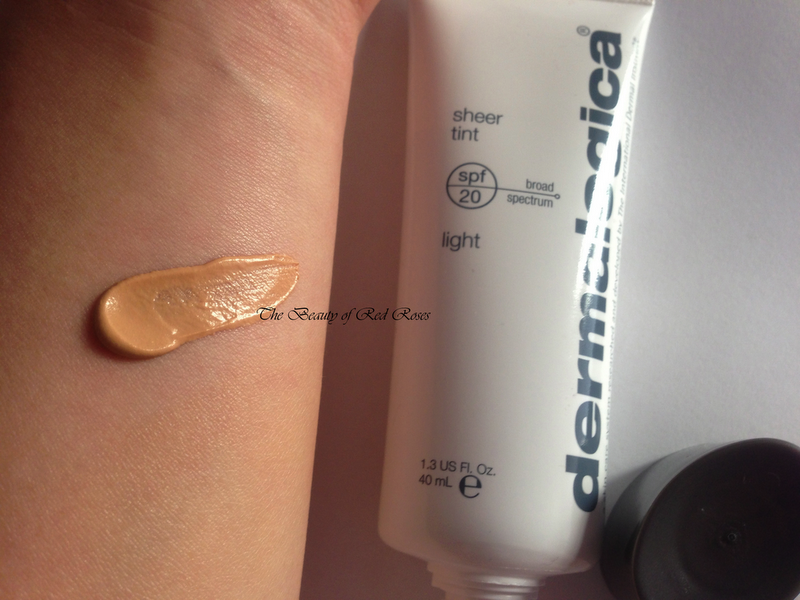 Swatch of Dermalogica Sheer Tint SPF20. I was very excited to trial the new Dermalogica Sheer Tint SPF20* as any product with combined effects of sun protection and skin treatment would be right up my alley. The sun up here in Brisbane has already changed my skin tone and it’s not even summer yet! 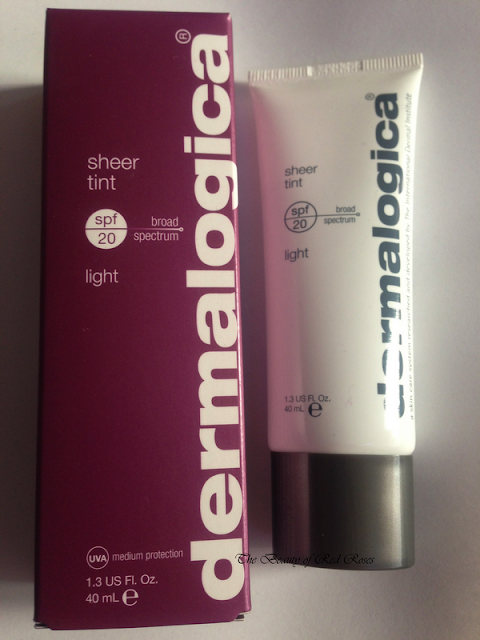 Dermalogica Sheer Tint SPF20 has a relatively thick consistency, which was quite surprising as typically sheer coverage foundation formulas are thin in consistency. Despite the thick consistency, the formula has a silicone feel to it, so the formula ended up being very easy to spread using a foundation brush and it just melts onto the skin! You can see a swatch of the product in the photo above and you can just notice below the swatch (in the same photo) what the product looks like when blended onto my skin. I absolutely adore the pleasant scent of this formula as it is reminiscent of soft aromatic Lavender (my fave scent! ), this makes application quite relaxing! On my combination/oily skin type, based on applying Dermalogica MediBac Oil Free Matte with SPF30*, Dermalogica Sheer Tint SPF20 followed by Burberry Luminous Compact Powder Foundation, my skin did end up appearing slightly dewy at the end of the day, however 'shiny' in a nice way. So, if you have a very oily skin type, I would definitely recommend applying powder foundation/finishing powder to absorb excess oils. The coverage is sheer, yet provides just the right amount of coverage to even my complexion and conceal small blemishes - consistent to that of tinted moisturiser. The overall look appears very natural yet gives your complexion a healthy looking finish suitable for everyday wear. Dermalogica Sheer Tint SPF20 is a great alternative for liquid foundation as I sometimes find liquid foundation a little too heavy for work wear. However, if you prefer more coverage, then the Dermalogica Cover Tint SPF20 would be suited for you. Dermalogica Cover Tint SPF20 provides more coverage than the sheer tint and features long-lasting coverage which is buildable to provide a finish equivalent to most liquid foundations. The creamy formula contains natural, light-diffusing ingredients and Iron Oxides to balance and even skin tone while softening fine lines. The formula also contains SPF20 to protect the skin from sun damage. The added benefits of the formula arise from the concoction of Hydrolysed Pearl and extracts of Ginseng, Purslane and Centella to firm and smooth the skin and marine extracts aid to hydrate the skin, minimise fine lines and even skin tone. Dermalogica Sheer/Cover Tint SPF20 is available in the shades Light, Medium and Dark. Dermalogica is available now from Dermalogica salons and David Jones stores nationally. What are your thoughts on products which are multifunctional? *Product was provided for consideration only. This review is 100% based on my own thoughts and opinions. I am not affiliated with Dermalogica and did not receive remuneration to post this product review. If this is the lightest colour there's no way it will ever match me! :( I hate it how companies never make their tinted products light enough.